Although gas pressure washers are more powerful, homeowners usually prefer their electric counterparts. 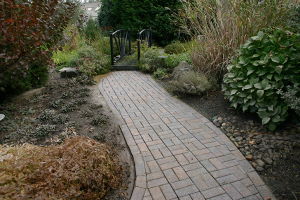 Much of the popularity of the electric pressure washer stems from its convenience. For example, an electric pressure washer can simply be attached to a power outlet and powered up. Furthermore, electric pressure washers are more affordable than gas pressure washers. 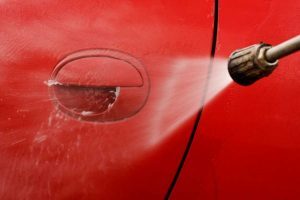 Of course, once you decide to go with an electric pressure washer, you must then decide which specific model is right for you. 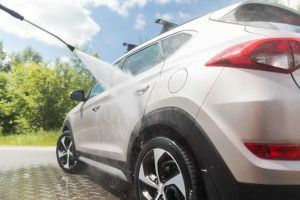 To help you with that decision, we’re going to be examining five of the best electric pressure washers in this article. Despite selling for less than $100 from most sources, the GPW1602 pressure washer from Greenworks boasts plenty of features to make it stand out from other models in its price range. The Greenworks GPW1602 boasts a PSI of 1600 and promises 1.2 gallons per minute. 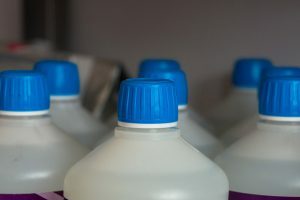 This means it is perfect for the kind of cleaning projects the casual pressure washer user takes on during the weekend. 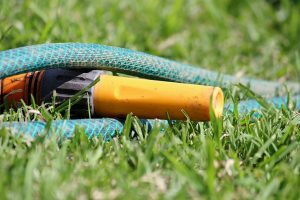 Weighing in at just 16 pounds, it can be easily maneuvered from place to place while its 20-foot hose means it can be relied upon to clean hard to reach spots of dirt and grime. Similarly, Greenworks equipped the GPW1602 with a 35-foot power cord, eliminating the need for an extension cord when using the product outdoors. 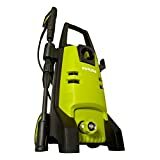 Greenworks packages this product with two quick-connect tips, one 25° in size and one 40° in size, making it one of the most versatile pressure washers you’re going to find for under $100. 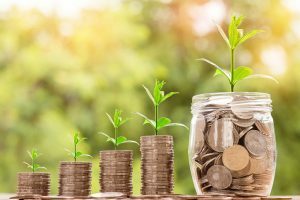 If you consider choosing the Greenworks GPW1602, it is important to remember that there are a couple of sacrifices you’ll have to make for its low price. 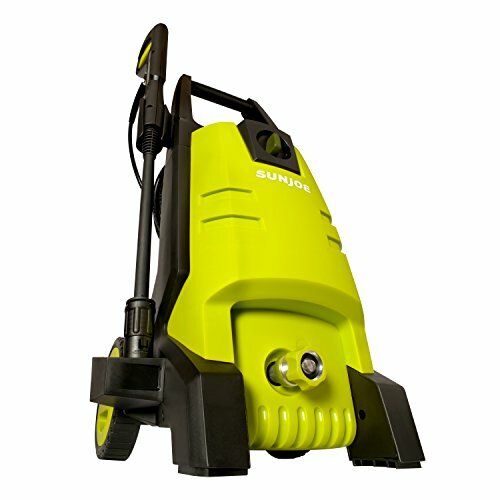 Unlike many of Greenworks’ pressure washers, the GPW1602 does not come fitted with a built-in soap tank. It is also lacking in an on-board hose reel, which may make storage of the product a little tricky. Continuing our theme of affordable electric pressure washers is this offering from Sun Joe. The Sun Joe Pressure Joe SPX1500 sells for even less than the previously discussed offering from Greenworks. The Sun Joe Pressure Joe SPX1500 comes equipped with a total stop system. This total stop system (TSS) senses when the pressure washer’s trigger is not engaged and stems the flow of water through its pump, conserving both energy and water and prolonging the life of the device itself. Fitted with a 12-Amp/1440-watt motor, the Pressure Joe SPX1500 boasts a PSI of 1740 and is capable of a maximum water flow rate of 1.59 GPM. 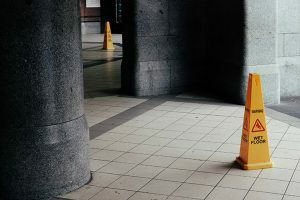 Even with its low price, reports of this electric pressure washer malfunctioning are rare. On the off chance your particular unit does not live up to your expectations, you will be able to fall back on the 2-year warranty which Sun Joe includes with every purchase of the product. 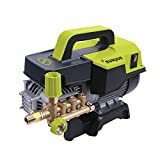 The Sun Joe Pressure Joe SPX1500 is quite similar to the Greenworks GPW1602 in that you will have to resign yourself to a couple of flaws because of its low price. Most notably, this pressure washer does not feature a built-in soap tank, which Sun Joe’s slightly more expensive models do. 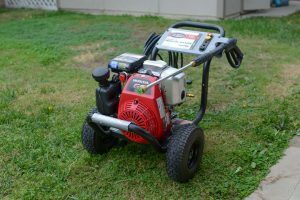 It should also be pointed out that a number of Sun Joe customers who have purchased this electric pressure washer have complained of it being quite loud, which is far from ideal if you live in a residential area and do not wish to disturb your neighbors. Taking us up a little in price is the Aqua2Go Pressure Washer. 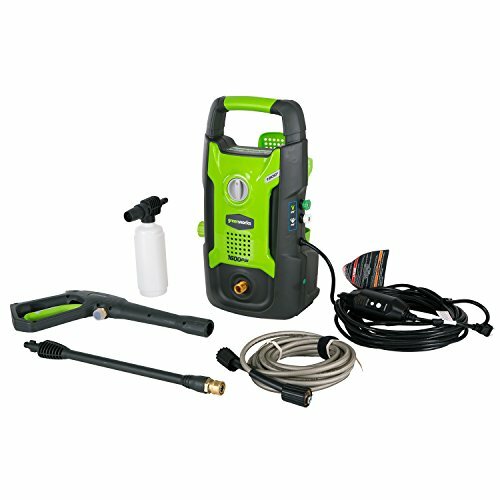 Arguably the most unique pressure washer on the market, this model can be relied upon for a whole lot more than cleaning patios and cars. 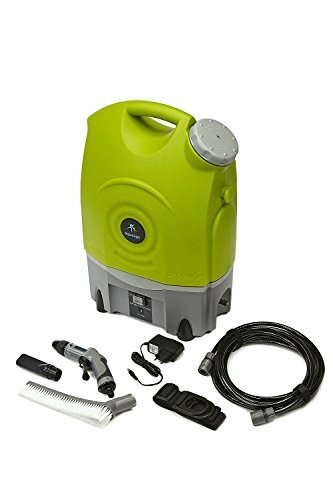 The Aqua2Go Pressure Washer was designed with campers and perpetual travelers in mind, which is why it comes fitted with a water reservoir, capable of providing a flow of water for close to 12 minutes. Similarly, it features a rechargeable battery, meaning it does not need to be connected to a power source before being turned on. This battery can be fully charged in two hours. When you purchase the Aqua2Go Pressure Washer, you will receive a number of additional accessories to heighten the using experience. Among these accessories you will find a spray nozzle, a long brush, and even a shower head. 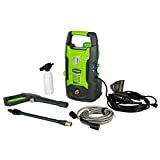 Weighing in at just 15.4 pounds, this pressure washer can be easily carried from your car to your campsite with no strain on your arms or back. With a PSI of just 130, this pressure washer should not be purchased if you are planning on anything beyond a light cleaning job. Despite its various additional features, this pressure washer does not come packaged with a soap dispensing brush, so you’ll have to set some cash aside to purchase one separately. With the SPX9004-PRO, Sun Joe marks its second appearance in this look at the best pressure washers. However, the brand’s SPX9004-PRO is arguably more impressive than its previous offering and is certainly worthy of your consideration if you don’t mind dropping the extra cash. The SPX9004-PRO comes equipped with a 13.5-amp motor and can reach a maximum PSI of 1300 with 2 gallons of water per minute. When you purchase the Sun Joe SPX9004-PRO, you will receive five quick-connect spray tips, the smallest having a size of 0° and the largest coming in at 40°. 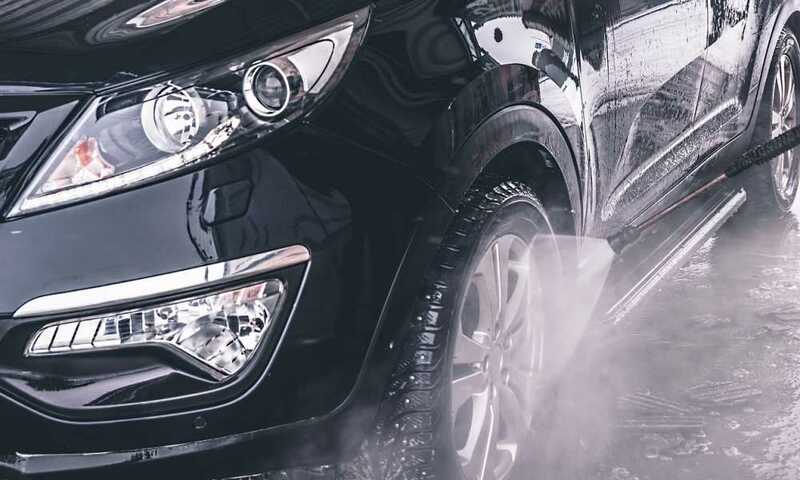 Its aforementioned motor is brushless and so can be relied upon longer than the brushed alternatives with which many rival electric pressure washers come fitted. As a consequence of its many features and its manufacturer’s history of excellence, this electric pressure washer is a higher priced product, which may make it an impossibility for many readers. Not only is the SPX9004-PRO the most expensive pressure washer to appear in this article, it is also the largest. Weighing in at 43 pounds, this model is a challenge to move from place to place and should be avoided by older homeowners who are no longer confident in their strength. A hat trick for Sun Joe, the Pressure Joe SPX2500 is very much the middle ground between the Sun Joe Pressure Joe SPX1500 and the Sun Joe SPX9004-PRO. Although the Sun Joe Pressure Joe SPX2500 is not as inexpensive as the brand’s SPX1500, it will not set you back anywhere near as much as the SPX9004. It boasts a maximum PSI of 1885, along with the ability to emit 1.59 gallons of water per minute. The pressure washer’s adjustable spray wand features a twist nozzle for greater control and can be relied upon for medium and heavy tasks, such as cleaning decking, siding, boats, and even RVs. Equipped with a total stop system (TSS), the Sun Joe Pressure Joe SPX2500 will waste neither water nor energy and will prolong the life of the pump and the pressure washer itself. Should problems arise prematurely with the washer, however, you will be able to turn to Sun Joe’s generous 2-year warranty to obtain a repair or replacement. The Sun Joe Pressure Joe SPX2500 is undeniably impressive once you get it up and running. 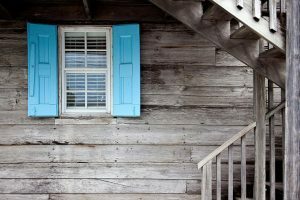 Getting it up and running, however, may be a little more difficult than you expect. 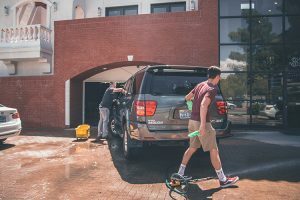 Many pressure washer novices who have purchased the SPX2500 have complained about the instructions with which it comes packaged, describing them as unclear and difficult to follow. Although we wouldn’t dare label any of the aforementioned electric pressure washers as definitively superior to all others, we do suggest that those who have the necessary budget go with the Sun Joe SPX9004-PRO. A commercial electric pressure washer, the SPX9004-PRO can be relied upon to complete any number of jobs, largely owing to its brushless induction motor and the five quick-connect tips with which it comes packaged. If you don’t have the budget or need for the Sun Joe SPX9004-PRO, you should consider going with the Greenworks offering which started off this list. With its 20-foot hose and 1600 PSI, the Greenworks GPW1602 promises a level of power which far exceeds its price, while its one-year warranty ensures you won’t have to worry about being out of pocket should a repair or replacement be necessary.